You are here: Home / Blog / Featured / What Are The Beginning Signs of Skin Cancer? Skin Cancer can be dangerous if left untreated for too long. Learn to recognize the beginning signs of skin cancer and how to protect yourself from the sun. The skin is the largest and fastest-growing organ of the human body. The skin has several main purposes. One is protection—against UV radiation from the sun or from tanning lamps, against heat and cold, and against infection and germs. It also serves as storage for water, fats, and oils, and provides the outer layer of the nervous system. Skin is made up of two main layers: the epidermis and the dermis. 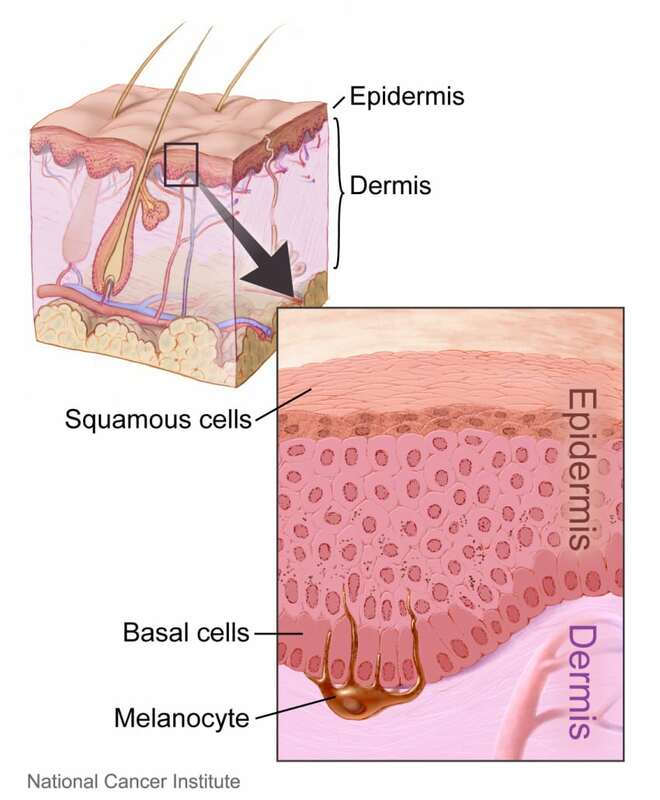 The epidermis is the top layer and is made of cells called squamous cells, basal cells, and melanocytes. Melanocytes, which are the cells that create the pigment which gives skin its color, darken in the sun to create sun tans. Squamous cells are on top. The dermis is the bottom layer, which holds biological structures like blood and lymph vessels and glands such as your sweat glands, which secrete sweat and oils through pores. When cells in the skin begin to malfunction, a person may develop skin cancer. There are three main types of skin cancer, named for the three types of skin cells described above: basal cell cancer, squamous cell cancer, and melanoma. Basal cell cancer is the most common and least dangerous, squamous cell is less common and more likely to spread, and melanoma is the rarest and the most likely to spread of the three. Any kind of skin cancer can be harmful or fatal if left untreated. The beginning signs of skin cancer involve a change in the skin. This may mean that a new lump or sore has formed on the skin, that a new mole has popped up, or that an existing mole has begun to grow or change in shape. Actini Keratosis (AK) is a pre-cancerous growth that may become skin cancer over time. AKs may show up as small patches on the skin that are pink, rough, dry, and/or scaly. The patches may be painful, burning, or itchy, particularly when pressure is applied. A pre-cancerous skin growth may indicate the beginnings of skin cancer. If you notice a spot like that make be an AK, schedule an appointment with a dermatologist to plan a course of action, which will like involve monitoring the spot on a regular basis to watch for any changes. Basal cell carcinomas (BCCs), or tumors developing from basal cell cancer, may be firm, flat, pale areas or raised areas that are pink, red, or translucent and shiny. Bumps may bleed after a minor cut or injury. Typically, BCCs appear on parts of the body that are exposed to the sun. Squamous cell carcinomas (SCCs), or tumors developing from squamous cell cancers, may show up as lumps that grow slowly over time, or may look like reddish patches on the skin that also get larger. The most common places for SCC to form are on the arms, legs, face, ears, and lips. While it is very uncommon that squamous or basal cell carcinomas will cause death, melanoma may be fatal if the disease spreads to other organ systems or places in the body. In many instances, a self-exam will help reveal a melanoma in the beginning signs of skin cancer. If the melanoma has spread, it can be cured by removing the affected area through surgery. Common early symptoms of melanoma include a new mole or freckle that pops up suddenly and grows quickly or any change to a mole or other pigmented area such as birthmarks and large freckles. Any moles or blemishes that change texture, shape, or color, any spots that are black, or any pigmented areas that itch or bleed may also indicate the early stages of melanoma. If you notice any of these occurrences, check with a dermatologist immediately. https://treatcancer.com/wp-content/uploads/2014/03/Layers_of_the_skin.jpg 1376 1136 Southeast Radiation Oncology Group, P.A. https://treatcancer.com/wp-content/uploads/2015/08/SERO-logo-PNG-450x174.png 2014-05-05 18:49:332018-10-11 12:14:05What Are The Beginning Signs of Skin Cancer?